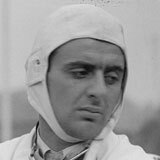 A successful grand prix driver in the golden days before the Second World War, Luigi was marginally past his peak by the time the World Championship came to be founded, although he was still quick enough to win the 1949 Dutch Grand Prix. After years with Maserati and Alfa Romeo, Luigi had moved to Ferrari in 1949 to encourage the career of his young friend Alberto Ascari, whom he recognized as having a far greater talent than his own. Luigi pulled out temporarily after Ascari's death in 1955, returning in 1956 for Maserati, only to crash badly at the non-championship Rome Grand Prix and retire.